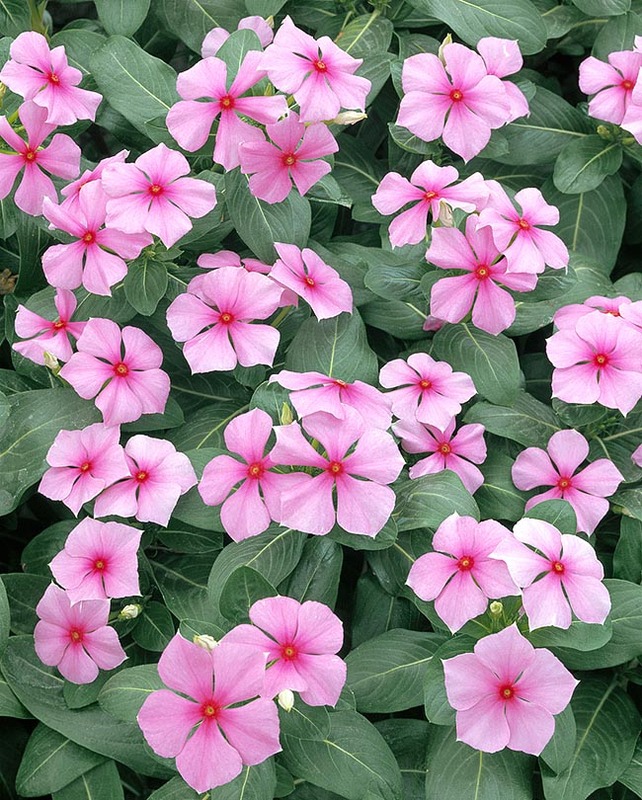 The Catharanthus roseus (L.) G.Don (1837) is native of Madagascar. The name of the genus is the combination of the Greek words “katharos“ = pure and “anthos” = flower ; the Latin name of the species “roseus” = pink, refers to the colour of the flowers. Common names: “vinca rosea”, “pervinca del Madagascar” (Italian); “Madagascar periwinkle”, “rose periwinkle”, “old-maid”, “bright eyes” (English); “pervenche de Madagascar”, “pervenche rose”, “catharanthe”, “rose amère”, “guille- mette” (French); “Madagascar-Immergrün”, “Rosafarbene Catharanthe”, (German); “vinca del cabo”, “vinca rose”, “vinca rosada”, “dominica”, “vincapervinca”, “catarantus”, “flor del principe”, “nomedejes”, “pervinca tropical”, “chuladita” (Spanish); “vinca”, “vinca-de-gato”, “vinca-de-Madagascar”, “boa-noite”, “maria-sem-vergonha”, “bom-dia” (Portuguese). Evergreen herbaceous plant, semi-woody at the base, tall up to about 60 cm, it shows opposite oblong leaves, up to about 6 cm of length, of dark glossy green colour with pale green midrib; axillary inflorescences with 1-4 flowers of about 5 cm of diameter with white to purple pink colour, with centre of pink to dark purple colour. The fruits are cylindrical, coupled follicles of about 3 mm of diameter and a length up to 4 cm. It easily reproduces by seed or by cutting. Plant nowadays spread and naturalized in all the tropics, it is widely elsewhere cultivated as annual, as it does not bear temperatures close to zero. Absolutely not demanding for what the soil is concerned, it can be cultivated both in full sun and in partial shade; it can stand even short periods of drought. All its parts are toxic due to the presence of various alkaloids; between these, the vincristine and the vinblastine, suitably modified, have shown their efficacy in curing some tumour forms, such as the leukaemia, the lymphomas, the breast and lung cancers. Synonyms: Vinca rosea L. (1759); Pervinca rosea (L.) Gaterau, (1789); Lochnera rosea (L.) Rchb. ex Endl. (1838); Ammocallis rosea (L.) Small (1903). → To appreciate the biodiversity within the APOCYNACEAE family please click here.